Back in 1969 (what my kids now refer to as the “olden days”), walking and bicycling to school was part of everyday life. Nearly half of all students traveled to school on foot or by bike. Today, that’s no longer the case, with only 13% of children walking or bicycling to school. Meanwhile, the percentage of children arriving at school by private automobile has increased from 12% to 44% (the rate of school bus ridership has stayed almost the same). 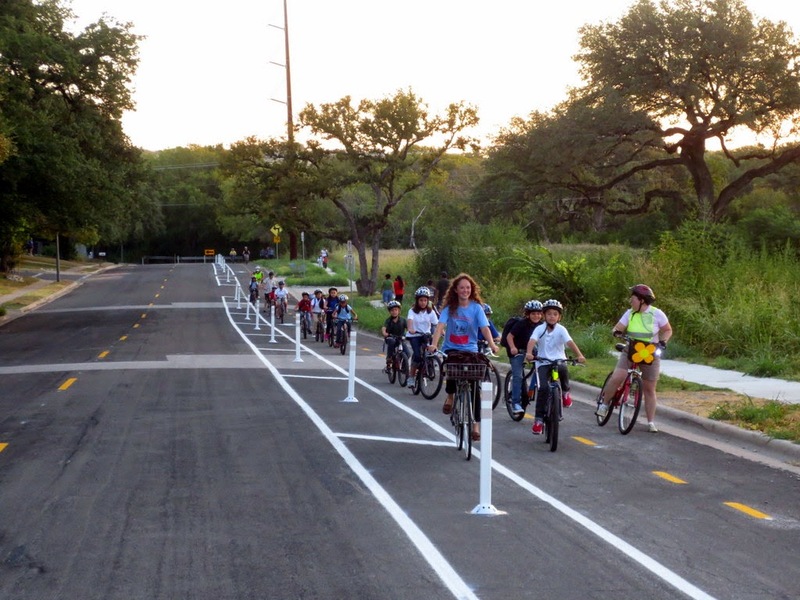 Austin is home to a number of innovative programs to encourage kids to bicycle to school. 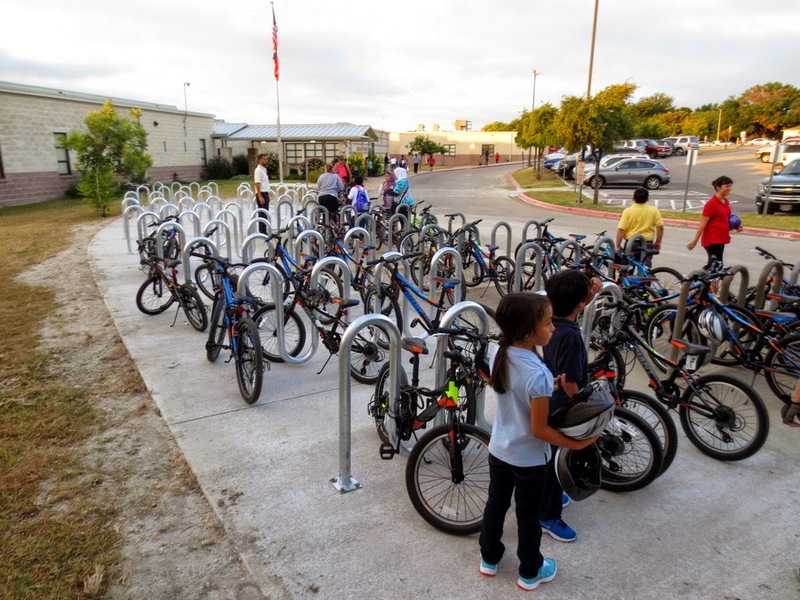 Last month, the City of Austin launched a major bicycle/walk-to-school initiative at Hart Elementary School, which serves a high proportion of low-income students with limited opportunities to be active. Along with the installation of a 1.3-mile cycle track connecting nearby apartment complexes to the school, the City secured 300 bikes to donate to children who commit to cycling to school. As of this week, more than 80 kids were cycling to school regularly! As part of the program, the City has set up bike trains and walking school buses with adult monitors to pick the students up from their apartment complexes and supervise their commute to school. (A bike train is an organized group of students who cycle together along a pre-arranged route to school under the close supervision of adults. A walking school bus is the pedestrian version of a bike train.) When the students arrive on campus, they swipe a special card so their parents can know they arrived safely. In addition to the City’s program at Hart Elementary, at least five other elementary schools in Austin low-income neighborhoods have recently started walking school bus programs. Meanwhile, parents and PTA organizations at a number of local schools have started their own bike trains. 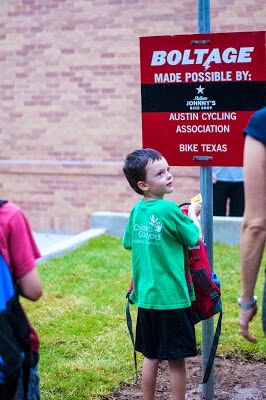 The City of Austin’s Child Safety program provides support to parents who want to set up their own bike trains, by providing maps for customized biking routes and reflective arm bands for participants. Several area schools, including Doss Elementary and Martin Middle Schools, have adopted high-tech approaches to get kids on bikes. One of these programs, Boltage, uses a solar-powered reader that records each child’s bike trip to school. The records are then used to reward students who commute to school regularly by bike. While Austin has made great progress recently in encouraging kids to cycle and bike to school, our community has a long ways to go if we want to reclaim the days when one out of every two kids bicycled or walked to school. By helping kids walk and bicycle to school, we can make a dent in child obesity rates here in Austin, where 38% of children in grades 3 to 8 are overweight or obese. Increasing cycling and walk-to-school rates also reduces traffic congestion. In some communities, as much as 30% of vehicle traffic in the morning rush hour is from children being driven to school. Safety remains the biggest barrier to getting more kids on bikes. We should all be advocating at City Hall for more local funding to create safer routes to schools, including sidewalks, cycle tracks, and neighborhood traffic calming. I love seeing what other cities are doing in this regards. Portland and Seattle, for example, are both building a network of neighborhood greenways that give priority to cyclists and pedestrians. By 2015, 80% of Portland residents will live within half a mile of a neighborhood greenway. At a neighborhood and school level, setting up a bike train or walking school bus can go a long way in overcoming parents’ concerns about safety. In Portland, bike trains are now a predominant feature of kids’ commute to school, supported by a robust cycling culture and even a website with information on bike trains in operation around the city. In Seattle, the school district is working to set up a bike train or walking school bus at every elementary school in the district. Austin is lucky to already have lots of success stories to build from to help our children bike and walk to school. Working together as a community to address the remaining barriers, I see no reason why we cannot reach the same goal that Seattle recently adopted—to get 50% of children walking and biking to school again. (Look for a longer version of this blog post in the November issue of Austin Fit).